Enjoy live music, food, vintage home decor, and more unique items at Caesar Creek Flea Market in Wilmington, OH. For more info, visit www.caesarcreek.com Find it. Love it. Make it yours! Open Fri. 10am-5pm, Sat. 9am-5pm and Sun. 10am-4pm. You’ll find plenty of antiques and collectibles, Amish furniture and more. Open year round, Sun.-Thurs. 9am-5pm, Fri.-Sat. 9am-6pm. Indoor and outdoor spaces available. Seasonal market open Sun. 5am-2pm April-October. 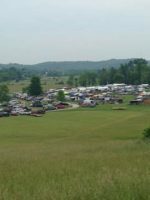 One of Ohio’s newest annual flea markets! Held every August, we are located on over 20 acres- lots of vendors and room for growth. Vendor news and information will be posted on Facebook. Open seasonally Directions: I-77 to Dover exit 83, Rte. 211 North 1.1 miles from Exit 83. Like us on Facebook. Open April-October, Sat. 9am-5pm and Sun. 10am-4pm. Like us on Facebook. Open 2nd weekend of every month, except Jan. Feb. and Aug. Sat. 9am-4pm and Sun. 9am-3pm. Located at Sandusky County Fairgrounds, 2 miles South of exit 91 Ohio Turnpike. Seasonal market open Fri.-Sun. 8am-5pm, April-December (second full weekend of each month), November (first full weekend), plus Christmas Bazaar 9am-5pm in December. Inside and outside dealer spaces…. 3-acres indoors and 12-acres outdoors. More than 100 indoor vendors and up to 800 outdoor seasonal vendors. Sarah’s Grill opens at 7am for breakfast. Market located on 3 big acres – lots of vendors and growing – come and check us out! Call Therese for info on specific dates. Like us on Facebook. Market open all year Saturday and Sunday, indoor/outdoor 8am – 3pm. Tuesdays May – September indoor/outdoor 8am – 2pm.